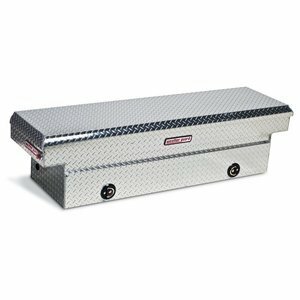 Crossover Truck Box, Single, Hinged Lid, 2 Springs, Aluminum, Cover 0.058 Tread, Body 0.058 Tread, Bottom 0.09 Smooth, Channels 0.09 Smooth Gauge, Overall Width (In.) 71-1/2, Overall Depth (In.) 20-1/4, Overall Height (In.) 18-1/2, Base Length (In.) 71-1/2, Base Width (In.) 20-1/4, Base Height (In.) 18-1/2, Storage (Cu.-Ft.) 15.3, Silver, Locking System (2) Push-Buttons w/Keys, Latch Mechanism (2) Automotive Style, Storage Bins 1, Mounting Crimp-Free, Drill-Free Clamped Brackets, Includes 2 Keys Weather Guard Truck Boxes and Storage DrawersUnits can be used separately or in combination with one another to suit particular applications.Fully weather stripped Powder-coated finish Limited lifetime warrantyCross BoxesHave 2 independent covers that allow access from either side of truck. Automotive-style rotary latch with tamper-resistant retracting lock. Buy Weather Guard 127002 Aluminum Saddle Box at Discounted Prices ✓ FREE DELIVERY possible on eligible purchases.